The Nigeria Internet Group (NIG) has elected the chief executive officer of IceCool Contract, Mr. Destiny Amana as its president for the next two years, reports ITRealms. The election of Amana, ITRealms gathered, followed the Annual General Meeting (AGM) held at the premises of the Nigeria Internet Registration Association (NIRA) in Lagos, Friday, January 5, 2018. Amana takes over from the immediate past president of NIG, Ms. Oyeronke M. Oyetunde. Also elected in the current executive committee of NIG is Dr Bayero Agabi as the new Vice President, Mrs. Nkem Uwaje-Begho, Treasurer; and Hilary Damissah emerged the Publicity Secretary. ITRealms equally gathered that the election was supervised by the representative of Board of Trustees (BOT) Chairman, Chief Olawale Ige, and former Vice Chancellor of Obafemi Awolowo University (OAU), Prof. Adeniyi Osuntokun, and former president, Engr. Lanre Ajayi as well Ms. Oyeronke M. Oyetunde were in attendance. 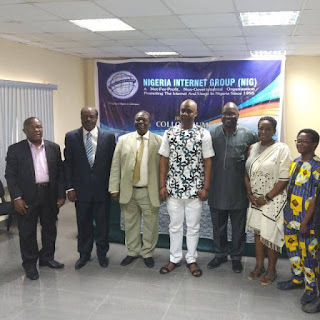 ITRealms recalls that the Nigeria Internet Group (NIG), founded in 1995, is a not-for-profit, non-governmental organization, promoting the Internet in Nigeria, with the objective of engaging Nigerian internet stakeholders on a number of activities which include policy advocacy, awareness creation and education. Pix: NIG Election AGM 2018: From left is NIG Executive Secretary, Mr. Fidelis Orji, former President, Mr. Lanre Ajayi, Prof. Adeniyi Osuntokun, newly elected vice president, Dr. Bayero Agabi, new president, Mr. Destiny Amana, immediate past president, Ms. Oyeronke M. Oyetunde and publicity secretary, Hilary Damissah, after the election in Lagos.